Elevation Change: 300-ft descent to Taft Point, 450-ft descent and ascent along Pohono Trail, 400-ft ascent to top of Sentinel Dome. The Sentinel Trailhead is located roughly 2.2 miles from the end of Glacier Point Road. While parking is a bit limited at the trailhead, makeshift parking is available along the road. WARNING: If you are visiting the area early in the season and the area is still covered in snow, hiking these trails may be dangerous to the general public as it is easy to get disoriented and lose the trail. Snow and ice may make the exposed sections treacherous. An old metal railing at the top of the ridge functions as the official Taft Point viewpoint although you can continue to the end of the ridge for even more awe-inspiring views of El Capitan to the west. This viewpoint is a wonderful place to relax and soak in the views. Return the way you came. If you are planning on doing the complete loop hike, back in the forest, turn left (north) at the trail junction to take the Pohono Trail to Sentinel Dome. 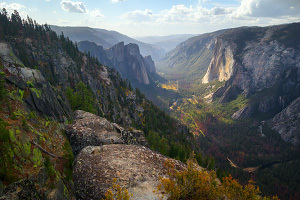 The Pohono Trail heads north and descends into Sentinel Creek valley, offering several beautiful teaser views down into Yosemite Valley. As the trail nears Sentinel Dome, it's time to grind out some uphill as the trail makes its way up and around the north side of the dome. At the next trail junction near the radio facility, make sure you don't accidentally take the trail to Glacier Point (unless you intend to)! 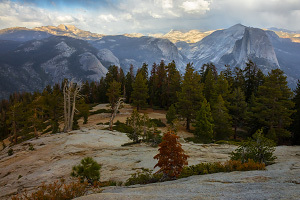 Whether you approach Sentinel Dome from the Pohono Trail or from the Sentinel Trailhead, the hike up the northeast side of the dome is fairly straightforward. The uphill hiking relents sooner than you would expect and once you clear the trees to reach the bare top of the dome, you are treated to panoramic views in all directions. An old metal compass marker points to many famous peaks in the distance. Be sure to descend the way you came up! 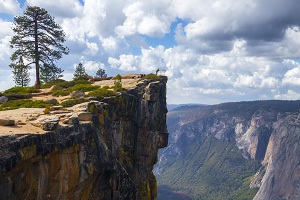 The hike to Taft Point and Sentinel Dome is a classic, offering many amazing views without requiring that much effort or elevation gain to get to them. While everybody talks about the views from Taft Point and Sentinel Dome, the teaser views along this section of the Pohono Trail are well worth the effort of doing the full loop hike.